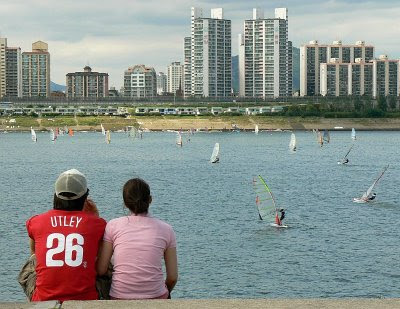 A young couple watch windsurfers on the Han River near Jamsil River Park. I took this photo yesterday after a long bicycle ride along the Han River. It was the first time that I had been this far up river and was amazed by the number of watercraft using this stretch of water. 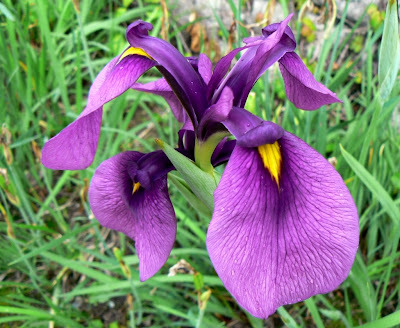 I spotted this flower in one of the gardens at Deoksu Palace. 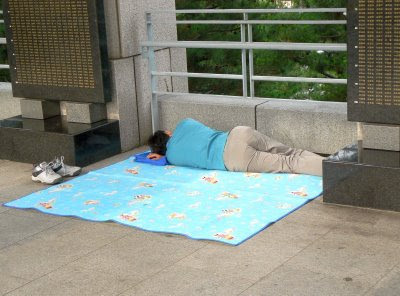 A man sleeps at the War Memorial of Korea between panels listing the numbers of fallen Korean Soldiers. 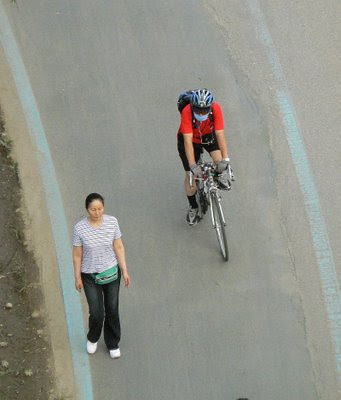 6:30 a.m. A cyclist and a walker do their thing on the bicycle path beside the Han River at Dongjak. A woman waters her crop of vegetables in the shadow of the rail/road bridge at Dongjak, while two gentlemen look on. This little patch of earth is sandwiched in between the bridge, a construction site, a canal and the Han River. I have seen other such patches beside railway lines and I admire the resourcefulness of the folks who turn these wasted little bits of grubby ground into green and productive gardens. 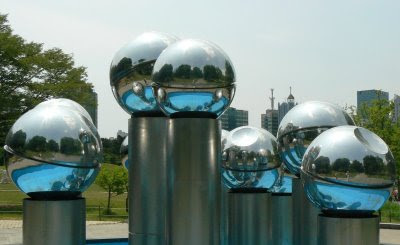 These spheres and cylinders form part of a sculpture in the middle of a fountain at Seoul Olympic Park. I like the multiple reflections. 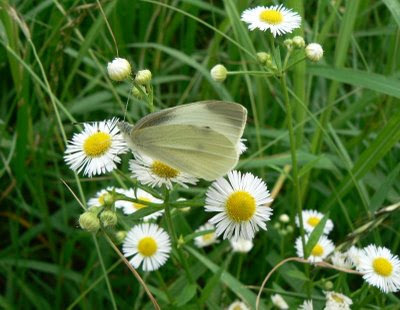 A white butterfly rests momentarily on a flower before fluttering away. This shot was taken down beside one of my favourite spots in Seoul, Cheongyecheon. 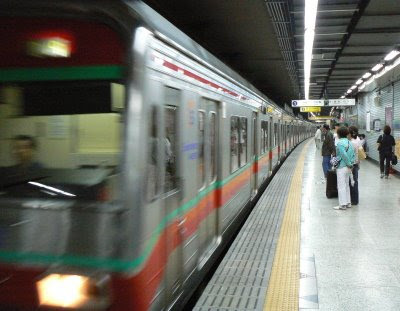 A driver brings his train into a Seoul Metro subway station. The subway system is my preferred way of getting around the city. It is fast, efficient, clean and relatively cheap, and is also a great place to people-watch. I frequently have young Koreans start up a conversation on the train in order to practise their English. I really admire them for their courage in doing so as I am not so brave yet to try to similarly practise my Korean! This photo of Cheonggyecheon was taken opposite the Cheonggyecheon Museum (visible at top left). 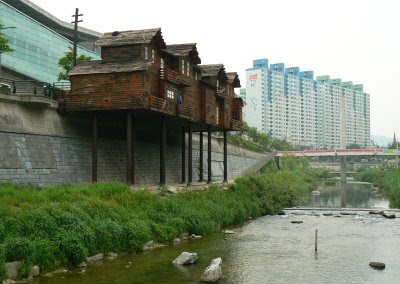 It shows a set of timber buildings that recreate stores and houses that would have been present along the stream prior to it being built over. In stark contrast to the large set of modern-day apartment blocks behind. PS - I was in Busan this weekend and so set up some scheduled posts to keep things going in my absence. However, I just got back and see that I must have messed up the dates as two posts went up on Satuday and none on Sunday (whoops!). Sorry folks. 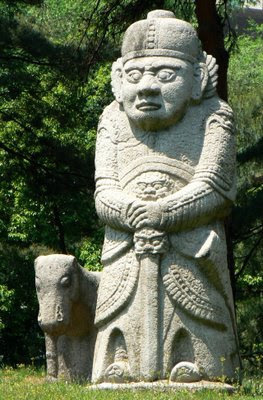 Two stone figures guarding the Seolleung and Jeongneung tombs. 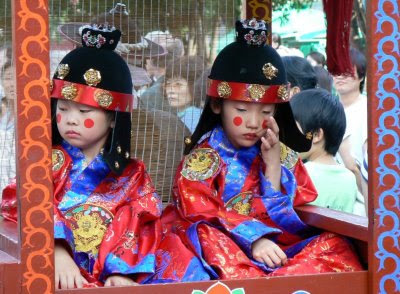 Two small boys in traditional costume sit inside a gama (a kind of palanquin) as part of a performance last weekend in Insadong near TapGol Park. The poor little guys seemed totally bored and uninterested in what was going on. The Wall of Hope is located between Hwanghakgyo and Biudanggyo along the sides of Cheonggyecheon. 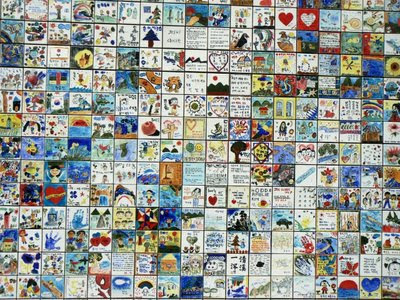 It consists of 20,000 ceramic tiles, each about 10 cm by 10 cm, that were painted by the citizens of Seoul with various messages and images of hope, inspiration and love. My photo, of just one small part, doesn't really do the wall justice as you need to see the tiles close-up to appreciate them fully. Two members of a South American dance troupe go through one of their routines while a couple of boys look on from backstage (look closely at the top left of the shot). The performance was staged recently in the rose garden at Seoul Grand Park. The photo today was taken during the Cheonggyecheon Challenge and is posted in honour of two very special people. Some weeks ago, I received a message from a reader of my blog in the United States who was in the process of adopting a child from South Korea. She was interested to know if I had taken any photos on or around the day of the birth of her soon to be adopted daughter. So I sent her a couple of photos and we exchanged several e-mails. Anyway, to cut a long story short, this week she and her husband are in Seoul to collect their daughter. On the weekend we had the opportunity to meet them, have a meal together and to do a little sightseeing. Out of consideration for their privacy, I will not mention names or include their photo here. However, "E" and "M" are two thoroughly likeable, warm-hearted and generous people who you can't help but respect and admire for taking on the challenge of adoption from South Korea. 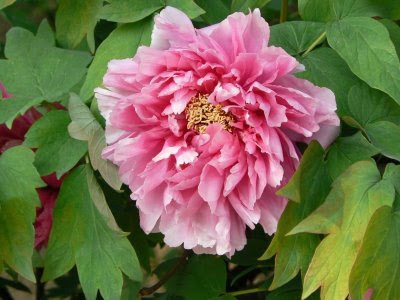 So I would like to take this opportunity to wish them all the very best with the lovely little 'flower' who is about to join their family and wish them all good health and happiness in their future together. Go n-eiri an t-adh leat! This photo was taken at the War Memorial of Korea. 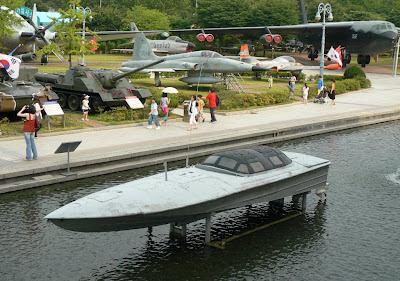 The boat at the front of the shot is a semi-submersible vessel that was used by North Korean guerrillas in an unsuccessful attempt to infiltrate into South Korea at Dadaepo, near Busan, on 3 December 1983. At the rear are a number of armoured fighting vehicles and several military aircraft, including a B52 bomber. Garlic features prominently in Korean cuisine. 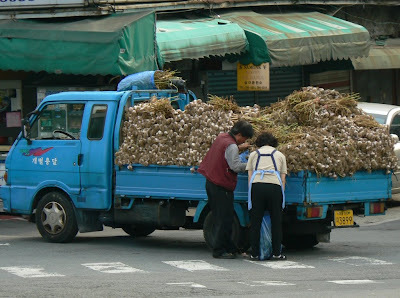 Here a garlic vendor sells some to the operator of a small restaurant near Samgakji subway station. I am told that Seoul is not a popular destination for vacationing vampires. 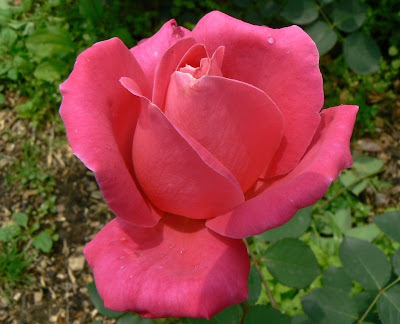 One of the many beautiful roses in the rose garden at Seoul Grand Park. 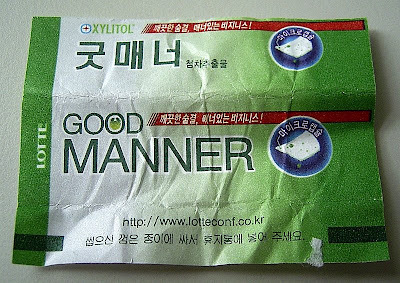 I was walking down the steps of my apartment block yesterday morning and saw this chewing gum wrapper on the ground. Kind of ironic I thought, that the person who bought the gum had displayed decidedly bad manners by tossing the wrapper onto the ground! 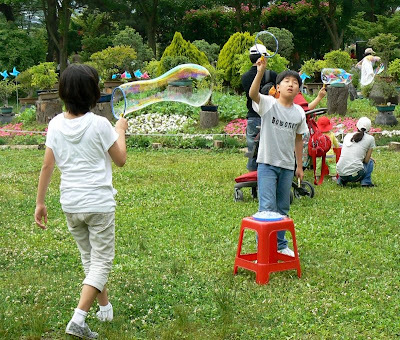 No, not the song by Colbie Caillat, but some children blowing big bubbles at Seoul Grand Park. I photographed this fine feathered fowl out at Seoul Olympic Park. A little later I saw him feeding with two female friends, but couldn't get close enough for a decent shot. With the possible exception of the recent outbreak of avian influenza here in Korea, life as as a pheasant seems rather pleasant in Seoul Olympic Park. 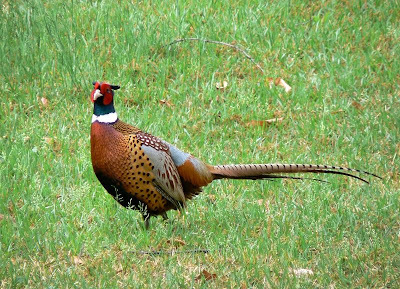 For those of you interested in folk songs and/or tongue-twisters, why not try wrapping your lips around 'The Pheasant Plucker's Song' (WARNING - this is not for the faint hearted!). I have posted previously about Cheonggyecheon, the restored stream running through the centre of Seoul. However, my explorations have focused on the western end of the water way in Downtown. 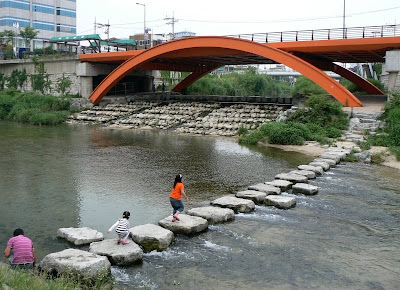 I only discovered recently that the restored stream wends its way for around six kilometres before finally flowing into the Han near Seoul Forest Park. On Sunday we set out to walk the full length of the stream, but fell short of our goal when the heavens opened up just after we reached the Cheonggyecheon Museum. We were forced to resort to catching the subway back home. In coming posts I will feature some of the photos that I took on this walk. The photo for today was taken near Biudanggyo. All along the stream there are sets of stepping stones like these ones, and the kids love running back and forth across them. 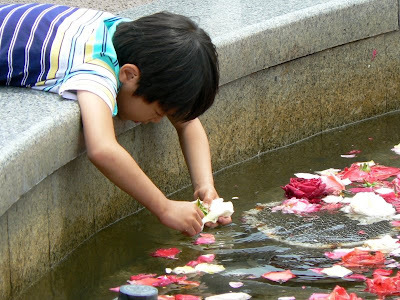 A little boy plays with the roses that have been placed in the fountain inside the rose garden at Seoul Grand Park. 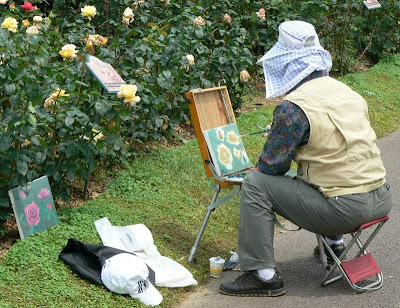 We went to the rose garden at Seoul Grand Park over the weekend where we saw this artist hard at work painting pictures of the roses. 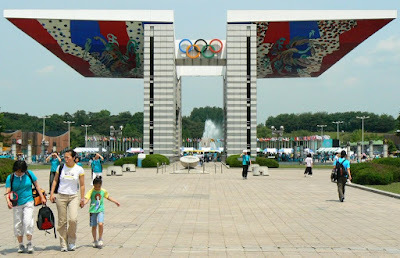 A photo of the World Peace Gate at Seoul Olympic Park. The gate dominates the entrance to the park and features painted images of four gods: the blue dragon; red bird; white tiger; and the turtle snake. 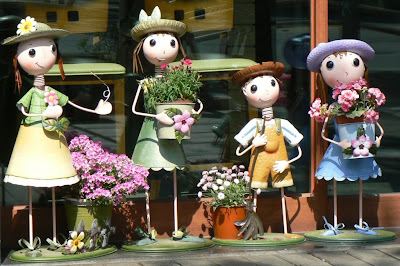 I saw these four little characters outside a coffee shop near Seolleung subway station and couldn't resist taking their photo. There is a lot of work going on each side of a road in Nakseongdae that I travel along on the bus each day on the way to work. They have been fixing up the gutters and the paving and also planting trees. 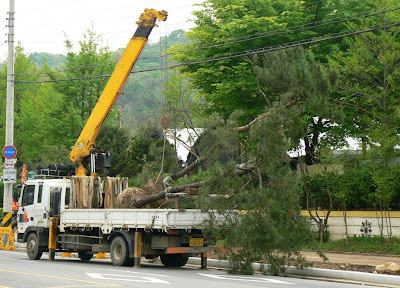 In the photo above, the driver of the truck is getting ready to hoist some large trees from the back of his truck onto the pavement. I was a little nervous about him hitting the overhead power lines with his crane, but he skillfully got them down safely. Although a little way out of Seoul, Namhansanseong can be easily reached by the subway system (line 8), so I feel justified in posting a photo taken there under the Seoul umbrella. 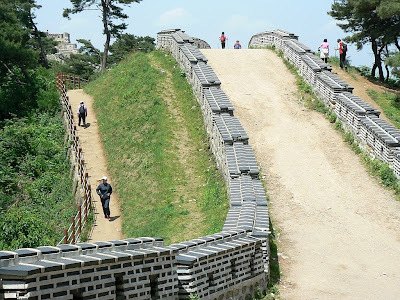 Namhansanseong means South Han Mountain Fortress and dates back to the 1600s. However, much of what can be seen today has been repaired/restored in more recent times. The shot above shows part of the fortress wall and hikers making their way around the base and top of the wall. Another shot of the wall snaking off into the distance can be seen here. 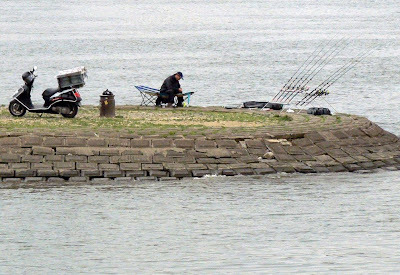 I saw this very well-equipped fisherman on the Han River near Inchon. Given the number of rods he has set up, he obviously takes his sport/hobby very seriously. 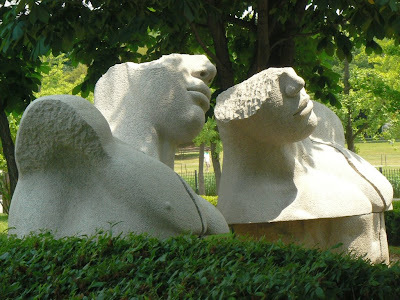 As promised in a recent post, here is another sculpture from the Seoul Olympic Park site. By the way, I have disabled the 'word verification' feature on Blogger Comments. I have had a little trouble at times reading the characters used so I figured that disabling this Blogger feature might make life a bit easier for those of you who have had a similar headache. The subject for 'Theme Day' this month is 'My Corner/Local Shop' and there are more than 170 blogs participating (please see the list below). On level 2 of my apartment complex there is a small Family Mart store which serves as my corner shop when I need a cold drink, snacks, bread or some milk. My apartment also has a monitor in the kitchen for two closed-circuit TV cameras that are trained on the playground and the plaza where the store is. 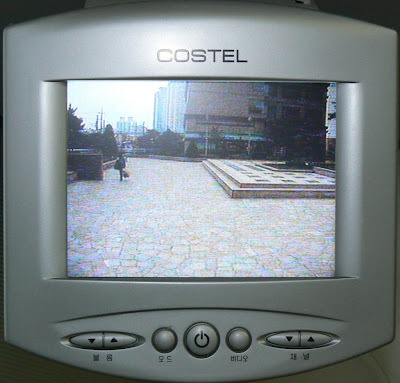 The image above shows the view of the plaza from the CCTV monitor with the store at rear right. A photo taken outside in front of the store can be seen here.